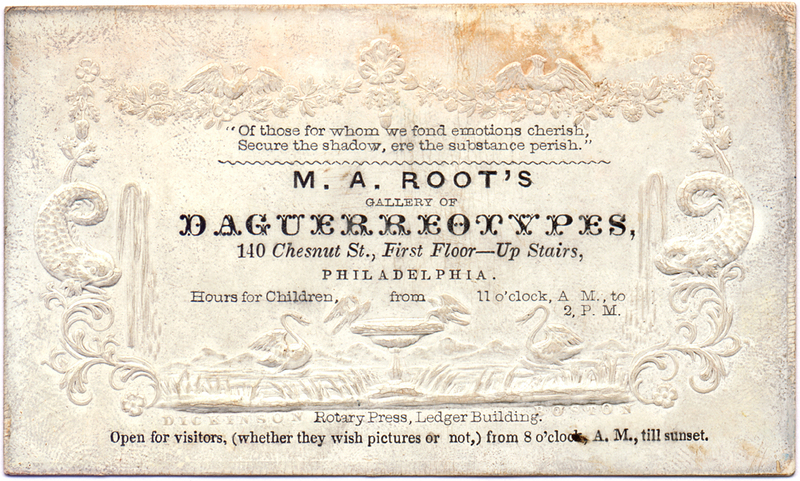 Title: M. A. Root's Gallery of Daguerreotypes, 140 Chesnut St.; Philadelphia. Description: 5.3 x 9.0 cm printed business card; embossed, enameled card stock. Notes/full text: "Of those for whom we fond emotions cherish, Secure the shadow, ere the substance perish." / M. A. Root’s Gallery of Daguerreotypes, 140 Chesnut Str., First Floor—Up Stairs, Philadelphia. / Hours for Children, from 11 o'clock, A. M., to 2, P. M. / Rotary Press, Ledger Building. / Open for visitors, (whether they wish pictures or not,) from 8 o'clock, A. M., till sunset.